Artist Homare Ikeda, Homare Ikeda paintings, Homare Ikeda watercolor paintings. To painter Homare Ikeda a blank paper can be a breath of the infinite. “As I make marks on paper, I am aware and not aware of the forms emerging. The forms and marks inter-act with each other. I feel they are voices trying to signify something.” Perhaps it takes the unique perspective of a childhood spent on a small island to see the infinite guises of the world in which we live; the unique skill of Homare Ikeda is in his translation of these reflections onto the blank canvas from which, it could be said, all life begins. 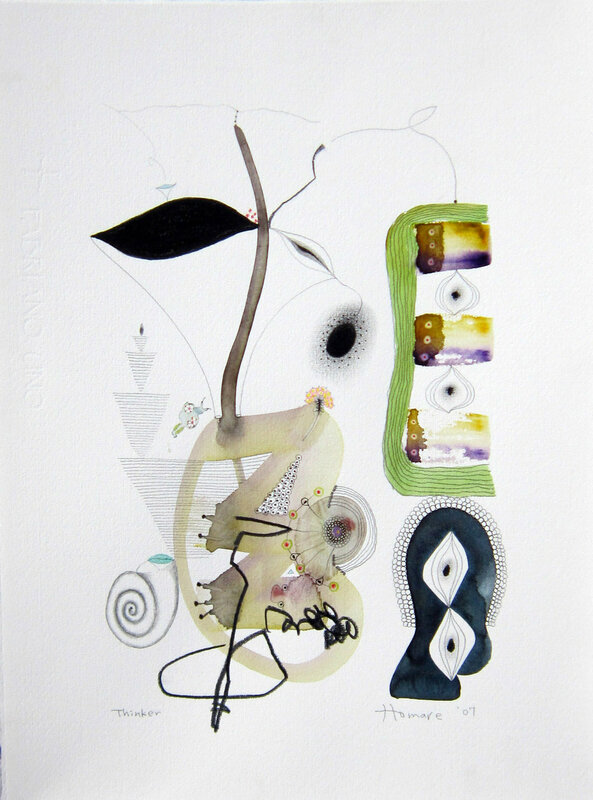 In the paintings by Homare Ikeda – watercolor with pen and ink often added – there is a playfulness to the artist’s sensitive lines and seed-like forms even as the images appear almost primordial in impression. Born on the subtropical island of Yoron, near Okinawa, Japan, Homare Ikeda spent his childhood exploring the island and the coral reefs surrounding it; after high school he left his small island world to explore Japan and India. Ikeda had no exposure to the world of fine arts but was interested nonetheless, teaching himself Oriental brush painting by copying pictures out of books and later becoming interested in contemporary art. In 1978 he moved to the United States. The artist credits a college professor in Stockton, California for setting him on the right artistic path. “He was a wonderful art professor; he spent all his energy on his teaching." This same professor guided Homare Ikeda to the University of Colorado at Boulder where he received both a BFA and MFA. Today, Ikeda teaches both drawing and painting while continuing to show his work in group and solo shows and expand his base of collectors. The artwork by Homare Ikeda can be linked to classic Abstract Expressionism and to the later Neo-Expressionism, but it's difficult to see any traditional Japanese influence. "My line, to me, is very Oriental,” Homare Ikeda observes, “and the way I compose forms is Oriental, too." This blending of East and West gives Ikeda's work its unique look: a look that evokes an innocent time and yet is surprisingly revelatory when examined up close.